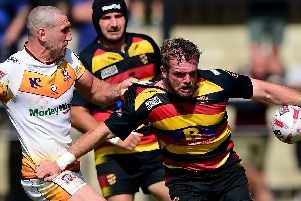 Leaders Sheffield Tigers, after a rare setback, got their National Three North title bid back on track with an eight-try, 48-0 victory over Birkenhead Park at Dore Moor. After failing to score a try in their 10-9 defeat at second placed Wirral a week earlier, Tigers snatched a valuable bonus as Wirral were held to a modest 21-17 win at mid-table Lymm. Wirral are now 14 points behind Tigers, but with a match in hand. Tigers went ahead after five minutes when prop Will Bennett crashed over. Then, straight from the kick-off, full-back Peter Swatkins added another try. Winger Henri Packard then raced over for two more, the first converted by Mark Ireland to make it 17-0 at the break. Packard completed his hat-trick, while inside centre Tom Outram took his tally for Tigers’ first XV over the 1,000-point mark when he crossed for a try. There was another milestone when Liam Wallace, normally an outside centre but playing at scrum-half, ran in two late tries in his 100th first team appearance. There was less joy for Sheffield RUFC, who were left to salvage a losing bonus when they were edged out 21-16 at Hull. After conceding two early penalties, Sheffield struck back to lead 11-6 at half time with a try by winger Rupert Broadley and two penalties from Joe Cribley. But they could manage only a further try by Gareth Morley on the other wing as Hull controlled the final stages. Dinnington scored a fine win at Wheatley Hills, leaving the hosts to salvage a losing bonus as they scored three tries to two in a 28-21 verdict. Second row Gary Woodcock scored two tries, with No 8 Ryan Donnelly also touching down and Jonny West converting two and three penalties. Wath on Dearne went down 74-7 away at West Leeds after winger Mark Calderwood scored a hat-trick for the hosts.